If you have a Trader Joe’s in your neighborhood, RUN, don’t walk, to the nearest Trader Joe’s, and pick up some of these AWESOME Weight Watcher Chocolate Chip Cookies! Produced by Trader Joe’s, you’ll get 5 of this yummy, low calorie cookies for a 2 Points. And the best part is that these healthy chocolate cookies are LOADED with vitamins, fiber, and antioxidants! That’s right, I said HEALTHY. And they really, really are! Chocolate Chip Cookies with a healthy dose of good-for-you ingredients….not bad. And they actually taste quite good! A bit on the small size, but hey, you get five of them, so it’s definitely an awesome Weight Watcher snack in my eyes. So, you wanna know the name of these fabulous chocolate chip cookies? Read on, my friends!! They are called Righteous Rounds and are produced exclusively by Trader Joe’s. I can’t find a pic of the package anywhere, but they are in a bright orange bag, with yellow title lettering on a pink background. If you don’t have access to a Trader Joe’s you might have to call a friend or family member who is near one and have them send you some! And if your Trader Joe’s doesn’t carry these low calorie cookies, ASK THE MANAGER IMMEDIATELY!! Part of the magic is that these weight watcher cookies have never been heated to more than 75 degrees. Instead, the moisture of the dough has been taken out, leaving a crispy cookie. This innovative process means that the chocolate chip cookies can retain the goodness of the nutrients in the cookies dough, which includes lycopene and beta-carotene. Both fruit and vegetable concentrates were added to the dough, and they are packed with fiber, making these tasty little cookies righteous indeed. 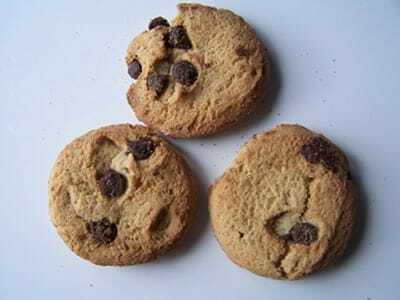 They also feature many of the ingredients of a traditional chocolate chip cookie like brown sugar, vanilla, and butter. They also have organic soy protein, molasses and cocoa to bolster great flavor and texture. Oh, and the most important part– they have lots of yummy chocolate chips in them!! This healthy cookie is an absolute MUST try. Seriously. PLUS, it has 50% Daily Value of Vitamin A, 35% Daily Value of Vitamin C, 10% Daily Value of Calcium, 6% Daily Value of Iron, 30% Daily Value of Thiamin, and 10% Daily Value of Riboflavin. DISCLAIMER: This is not an official Weight Watchers Cookie. Nor is it a Weight Watchers Recipe for Chocolate Chip Cookies. I just went buy TJ's today and they told me these cookies were discontinued last May, bummer! I love Trader Joes, went last week and I love it. I love the Better than Peanut Butter, 2 tbs. is 2 points, but one is enough for me. Also, love the kettle corn, 2 points for a bag and its a good portion. Ooo…yes, the Lite Kettle Corn!! I've tried that before and it's fantastic. Plus, I love that it comes in those individually portioned bags. Yay Trader Joe's! I miss Trader Joe's so much after moving from CA to NC. I would sure love some low-cal chocolate chip cookies! I JUST WENT TO TRADER JOES this a.m. – arg! Wish I'd known about these cookies, but they are on the list for the next trip – LOVE TJs! !